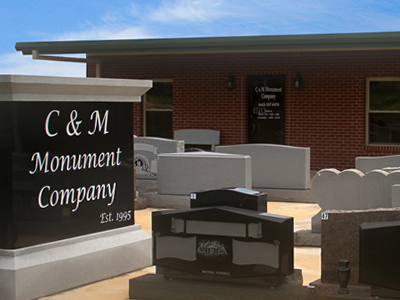 C & M Monument Company was born from the belief that we could help loved ones in time of loss by providing quality markers of remembrance at an affordable cost. Our goal is to offer monuments that beautifully celebrate the life of the one who has passed on. We care about the little things that remind us of our loved ones and the life they lived. To provide you the highest quality custom monument that meets the need of every individual at the most affordable price possible. © 2013 C & M Monument Company. All Rights Reserved. All property contained on this website are owned by C & M Monument Company, Inc. However, if you feel intellectual property rights have been infringed upon, please contact C & M Monument Company, Inc. at cmmonuments@bellsouth.net. Our Online Order Form only collects user information for the expressed purpose of providing clients with faster service. Site analytics only collects user information to determine user interaction on the website for product popularity and site development purposes. (Data collected via clicked links, cookies, user interaction, etc.) No customer information is sold or distributed to third parties for any reason. If compelled by state or federal law to disclose user information, C & M Monument Company, Inc. will comply with such orders. If you would like to opt out of future communications with C & M Monument Company, Inc., please email us at cmmonuments@bellsouth.net. If you would like to update your Online Order Form information with C & M Monument Company, please email your updated information to cmmonuments@bellsouth.net.